Collinsville City Fire Chief Chief Russell Young spoke to the Chamber members about fire safety. He showed a video demonstrating the big difference in the burn rate of a well watered Christmas tree -vs- a dry tree. Chief Young also noted a several other holiday fire hazards including candles, wiring overloads, fireplaces, unattended cooking, ... for example. Chamber President Teresa Brown gave a personal testimonial on the impacts of a house fire, having lost her home to fire in 2009. 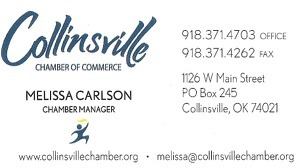 Sidney Worrell (of New Spin 360) presented samples of a proposed addition to the City of Collinsville web site with virtual tours of Collinsville businesses. The city would cover New Spins' costs except $5 per month for each participating business. The 360 camera footage and zoom / directional controls provide a preview of the inside of the business for potential customers. The group will also be in town filming for a video in conjunction with the Christmas parade and "Live at The Crown" events. Her email is worrell@newspin.com.